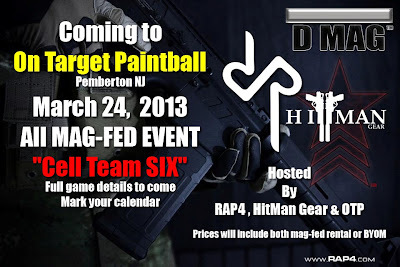 On Target Paintball in New Jersey will be hosting a mag-fed event on March 24, 2013 that the American (and border adjacent) milsim/mag-fed cadre should definitely check out. If you're interested be sure to check out the Facebook event page. Rental markers will be the RAP4 468, and the Facebook indicates that there will be a rent to own option the day of. As the retail industry says, "If they try, they'll buy! ".